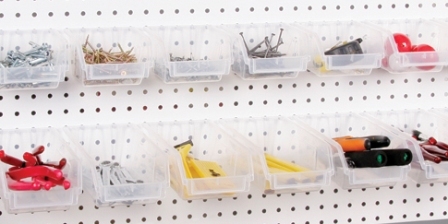 Slatbox Pegboard Bins are a convenient and easy way to display or store items on pegboard. These durable bins are available in many different colors, sizes, and styles. Shop our entire Slatbox inventory to find the right display bin for your home or store! Note that some Slatbox bins require the Pegboard Adapter (#35009) to fit pegboard. Our Slatbox Bins are super strong and lightweight! 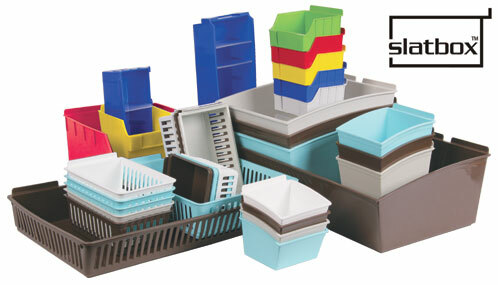 Slatbox Bins are carefully designed to be affordable, super strong, and easy to use. These display bins come in a variety of colors. Slatbox Display Bins are easy to clean, hang, and offer maximum product views. Slatbox helps make the most out of wall space. The slatbox line is attractive and cost-effective. Display your merchandise with the Palay Display slatbox bin.